Warehouses and fulfillment centers are often thought of as similar and the words used interchangeably. In reality though, they are quite different. While both fulfillment centers and warehouses are large buildings that store inventory for businesses that sell products, that's pretty much where the similarities end. The services that each provide and the cases where each are used vary widely, depending on the needs of the organizations that uses them. Here we will explore the functions of each, so you can better choose which is right for you and your business needs. What are warehouses and when are they used? 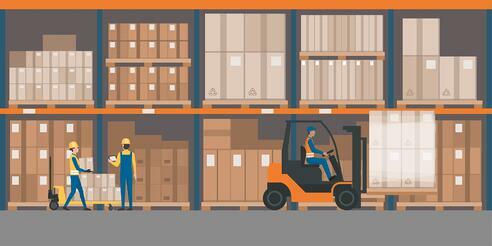 A warehouse usually refers to a building where goods and products are stored for an extended period of time. It's a place designed to store or house a business's inventory in bulk until it is needed (i.e. your business offers a seasonal product and needs a place to store things during the rest of the year when your product isn't in demand). If you walk into a warehouse, you'll see high shelves stacked with many products, and forklifts driving around and moving containers. Operationally, what happens in a warehouse on a day to day basis is pretty static. Inventory is added, moved to different locations when necessary and transferred out. Fulfillment centers can act as a warehouse too, however, warehouses do not double as fulfillment centers. Sometimes, warehouse companies are focused more on businesses that work with wholesale, or business to business orders that deal with large quantities of products. Larger retailers have warehouses where they can store their extra products, or they rent warehouses to share with other businesses. Typically, it's a smart and cost-effective idea for smaller or mid-sized retailers to lease warehouse space, depending on the terms of the lease. If you're simply looking to store your business's extra products until they're needed, and smaller storage options aren't working out, a warehouse might be what your business needs. What does a fulfillment center do? Like a warehouse, a fulfillment center is also a large building that stores inventory for a business. However, it also serves many other purposes as well. A fulfillment center, also known as a 3PL provider, typically stores products for short periods of time before the product is shipped out. They work with retailers, e-commerce companies, corporations, etc. to fulfill B2B and B2C orders. It’s a fulfillment center's duty to get products out to customers who just placed an order as quickly as possible. Unlike a warehouse, inventory won't sit in a fulfillment center for very long (usually not for more than a month or so) - the main goal is to get the product out to the customers who need it as soon as possible. Retail orders are usually shipped from a fulfillment center rather than from a warehouse. Even if you're storing extra products in a warehouse, they can be shipped from the warehouse to a fulfillment center, where they move quickly through the fulfillment center and then out to their final destination with the customer. A warehouse doesn't serve external customers, while, on the other hand, serving external customers is the main focus of a fulfillment center. Fulfillment centers are often bustling with activity. They are always working around the clock to process, pack, and ship orders to customers. In addition, they receive shipments of inventory, have people picking items, packing up boxes, and labeling shipments and orders, ship out fulfilled orders and handle returns. Because of that, fulfillment centers are equipped with the best technology for processing orders, managing inventory, organizing transportation, and similar tasks. Fulfillment centers are great options for businesses that don't have to time or capacity to store, pack, and ship orders. Fulfillment center vs. Warehouse, which is right for you? If you're a small or medium sized business or retailer, it's important to think about your storage and shipping needs before you make this decision. If you find that you're spending lots of time packing up boxes and shipping out orders, it might be time to consider outsourcing your fulfillment process. In addition, depending on the facilities you have, you may be running out of storage space (especially if you're running your business out of your home). If you're simply looking for more space to store your products, storage units can be a cheap and effective solution. As you grow your business, and need more space, a warehouse might make sense, but in today's world of digital shopping, a fulfillment center has much more functionality and can handle many tasks in one place. As an e-commerce business owner, it's important to manage your inventory well in order to use your budget efficiently and please your most valuable resource - your customers. Though the terminology is sometimes used interchangeably, fulfillment centers and warehouses have very different functionality. Warehousing companies simply store products to be used at a later date, while fulfillment centers house products briefly, pick and pack orders, and make sure they get into the hands of your customers in a timely matter. If you're a business owner and you're thinking of outsourcing your fulfillment process, contact us to learn more about our services. PBD Worldwide has six facilities throughout the United States, each designed with your business in mind. We offer same-day shipping, which means that most packages are delivered within two business days. Delivering a product quickly and accurately is important for any business. With PBD Worldwide, you can be rest assured that your customers will get the very best experience possible.